Johnny Depp is in Wisconsin this month shooting a John Dillinger film based on the book Public Enemies by Bryan Burrough. While in Wisconsin the Michael Mann directed film will be shooting in Columbus, Darlington, Madison and Milwaukee. Wisconsin is just over the Mississippi River from Iowa and has had a three-year legislative wrestling match for the final passage of a state incentive package to attract filmmakers. Film Wisconsin’s executive director Scott Robbe reports of an interim measure for qualified producers and should be encouraged by Depp filming in the state. While Wisconsin’s film related history is often overlooked, it does have some legendary connections. 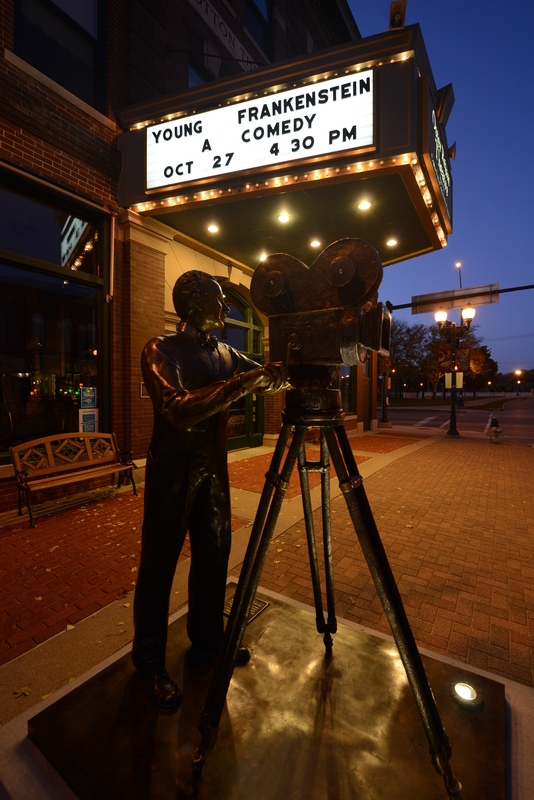 Pulitzer Prize-winning writer Thorton Wilder (Our Town) was from Madison and the man named by the British Film Institute as the greatest director of all time, Orson Welles (Citizen Kane) was born in Kenosha. Nicolas Ray, who directed Rebel Without a Cause, was from the small town of Galesville. Actor/writer Gene Wilder (Young Frankenstein) is a Wisconsin-Iowa combo having been born in Milwaukee and was a theater major at the University of Iowa. Wilder-Depp connection: Willy Wonka & the Chocolate Factory and the remake. Milwaukee was also the setting of one of the most popular all-time TV programs, Happy Days. (I had said Kenosha in an earlier post, but only “Al the Grocer”–Al Molinaro– was from there.) The setting for the TV program Laverne & Shirley was also Milwaukee. One of the most well-known film characters of all time, Jack from Titanic (played by Leonardo DiCaprio) was from Chippewa Falls. And I have to add that his love interest Rose when we find her as an elderly woman is living in Cedar Rapids, Iowa. DiCapario and Depp both starred in What’s Eating Gilbert Grape that was set in Iowa and written by Des Moines native Peter Hedges. Wisconsin news is usually overshadowed by the Green Bay Packers football team and their cheese head fans. (I once did a shoot with Packer Hall-of-Famer Reggie White, the minister of defense, and found him to be a friendly and kind man.) Wisconsin is also where Land’s End clothing, Oshkosh B’Gosh, Kohler, Harley-Davidson, and Trek Bicycle Corporation, have their headquarters, but it does have its artistic bent. In fact, check out the work Madison interactive group Planet Propaganda is doing — not only with Trek but companies in Chicago, Minneapolis and on both coasts. And just for the record its creative director John Besmer is a screenwriter as well. He was one of the writers of the recently completed Winter of Frozen Dreams starring Keith Carradine. Madison is also just two hours away from Chicago by train. And about an hour away from hidden (to people outside the area) jewel of a town called Lake Geneva, which has been called “The Newport of the West” and “The Hamptons of the Midwest” for its mansions on the lake. The University of Wisconsin, Madison is where “America’s Finest News Source” and satire The Onion began and where Oscar-winning writer/director Michael Moore (Bowling for Columbine) went to school. Zucker, Abrahams and Zucker (David, Jim & Jerry) grew up in Shorewood, Wisconsin and attended UW Madison together before hitting it big with Airplane! in 1980, and other hit films that followed. Documentary filmmaker Errol Morris (The Thin Blue Line) and producer Walter Mirisch (The Apartment) also graduated from UW-Madison. I know this will be hard to believe but with a Ph.D. from UW-Madison is screenwriter/director Andrew Bergman, whose work includes Blazing Saddles, Fletch, Honeymoon in Vegas, and Striptease. Woody Allen’s co-writer on Manhattan, Sleeper, and Annie Hall is Academy Award winner writer Marshall Brickman –who, yes, attended UW-Madison. Those also attending UW-Madison include screenwriter/director David Koepp who wrote the upcoming script for the new Indiana Jones film (as well as Spider-Man and the Depp thriller Secret Window) and Michael Mann (Miami Vice) himself. Marjorie Kinnan Rawlings graduated from UW-Madison in 1918 twenty years before her book The Yearling was published. Recent Oscar-winning screenwriter Diablo Cody (Juno) wanted to attend UW Madison but says she went to University of Iowa was because she couldn’t get into Madison. Elsewhere in the state many memorable movies have been shot in Wisconsin including A Simple Plan (from a novel by the other Scott Smith), Blues Brothers, Mr. 3000, Meet the Applegates, Uncle Buck, Major League, and parts of Hoop Dreams. Wayne: So, do you come to Milwaukee often? Alice Cooper: Well, I’m a regular visitor here, but Milwaukee has certainly had its share of visitors. The French missionaries and explorers were coming here in the late sixteen hundreds to trade with the native Americans. Pete (Band member): In fact, isn’t Milwaukee an Indian name? Alice: I think one of the most interesting aspects of Milwaukee is the fact that it’s the only major American city to have ever elected three socialist mayors. Wayne: Does this guy know how to party or what? When I was 19 I went to an Alice Cooper concert in Tampa and about 15 years later met him at a conference I was working in San Diego. Like Reggie White he too appeared to be a friendly and gentle man. (Though quite a bit smaller than White.) He’s quite the golfer and joked that his garage looked like Nevada Bob’s (a chain of golf wholesale stores). As we pull away from our little road trip to Wisconsin let me say that Depp is originally from Owensboro, Kentucky and once driving back to Iowa from a shoot in Charlotte I spent the night in Owensboro. I’m a sucker for shooting neon signs and took this photo near Depp’s childhood house. Did you know that writer Hunter S. Thompson was also from Owensboro? The same guy Depp played in Fear and Loathing in Las Vegas. Oh, and back home in Iowa I received a call Saturday to work on a feature film shooting in Des Moines in April and May staring Ellen Page, the star of Juno. That’s really coming full circle for this blog since I started Screenwriting from Iowa after seeing Juno. Schedule-wise I don’t think I’m going to be able to work on that film but it’s good to see that Iowa’s film incentives are working as well. Actors interested in auditioning for the Ellen Page thriller send pictures, resume, and contact info to PMS Casting, 2018 Hwy G28, PO Box 122, Pella, IA 50219. More info can be found on Iowa casting director Ann Wilkinson’s website www.pmscasting.com . P.S. Anyone looking for a different place to vacation this summer? One of the great travel surprises of my life was visiting Door County in Wisconsin years ago. I was blown away by how much it reminded me of the Florida Keys. (Good place for actors to find summer stock work as well.) And if you want more of a taste of Florida in Wisconsin, Jimmy Buffett will be playing in Apple Valley on July 19. Yesterday the Oscar nominations were announced and Diablo Cody and her script Juno were nominated for best original screenplay and the film was also nominated for best picture. I recently pointed out her Iowa connection as having graduated from the University of Iowa. If you’re not familiar with the creative talent that has come out of the University of Iowa hold on for what I’m about to tell you. You’ll be hard pressed to find a university that has educated and attracted more novelist, poets, essayist, screenwriters and short story writers at such a high level of proficiency and acclaim. The campus is located just off Interstate 80 in Iowa City. Head west on 80 from New York City and you’ll run right into it. Head east on 80 from San Francisco (or via Park City if you’re coming from Sundance) and you’ll be heading toward the promise land of creative talent. And if you happen to be in Cedar Falls where I’m typing this, it’s just a little over an hour drive south. Its famed Iowa Writers’ Workshop is the oldest and most prestigious MFA writing program in the country. The program has produced thirteen Pulitzer Prize winners, and has had professors such as Kurt Vonnegut (Slaughterhouse-Five), Robert Penn Warren (All the King’s Men) and Philip Roth (The Human Stain). Its notable MFA alumni whose writings have become movies include John Irving (The World According to Garp), W.P.Kinsella (Shoeless Joe, which became the movie Field of Dreams), Leonard Schrader (screenplay, Kiss of the Spider Woman), Ethan Canin (The Palace Thief that became the movie The Emperor’s Club), Michael Cunningham (The Hours), Nicholas Meyer (Oscar-nominated The-Seven-Percent-Solution), Robert Nelson Jacobs (screenplay, Chocolat), Max Allan Collins (The Road to Perdition) and Anthony Swofford (Jarhead). Most recently two Iowa grads have had books listed in The New York Times 10 best books of 2007; Tree of Smoke by Denis Johnson and Then We Came to an End by Joshua Ferris. Those educated at the University of Iowa (though not in the writing program) include Stewart Stern (Rebel Without a Cause), Barry Kemp (Coach), actor/writer Gene Wilder (Young Frankenstein), producer Mark Johnson (Rain Man), Richard Maibaum (12 James Bond films including From Russia with Love), and the great playwright Tennessee Williams (A Streetcar Named Desire). I’m sure I’ve missed many people, but I think you get the point. But make no mistake, Cody’s quirky mix of Midwest roots (she wrote Juno while living in Minneapolis) are what make her writing original. (Ditto that for the Minneapolis raised Coen brothers who just received writing and directing Oscar nominations for No Country for Old Men.) And that originality is what makes Cody attractive to Hollywood, both as a writer and as a person. Stick to your dreams and more importantly keep writing. May 2008 Addition: The Juno-Iowa Connection Part 2. Ellen Page the talented lead actress in Juno is in Des Moines this month shooting Peacock with Cillian Murphy. For more about Iowa and Diablo Cody read the post Life Beyond Hollywood. To read more about University of Iowa graduate John Irving read John Irving, Iowa & Writing.